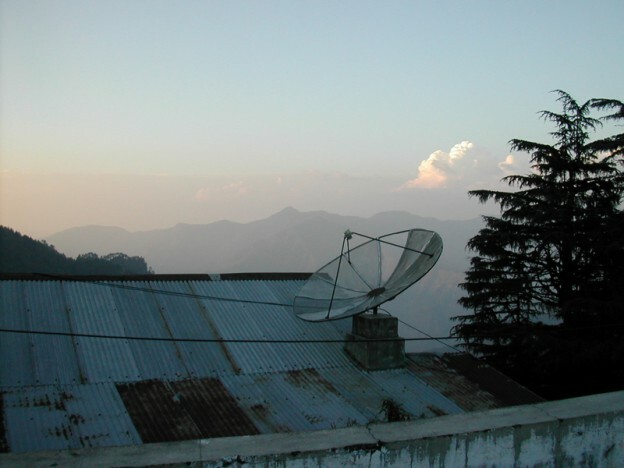 In my four years in Mussoorie I spoke with my parents by phone twice, I think, and can’t remember now what for – there must have been some kind of emergency or urgent news. There were only a few phones on campus, and none in teachers´ residences except perhaps the principal´s. The few we had didn’t work very well: calling across Mussoorie could take several attempts to get a line at all. Calling out of town required that a “trunk call” be booked hours in advance, and such calls were extremely expensive. 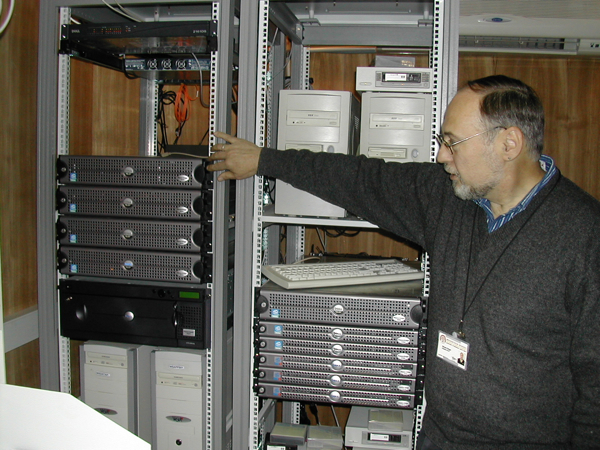 In 1996, Steve Ediger arrived to take on the Herculean task of bringing Woodstock into the modern age of computers and communications, just as India itself was making a great technological leap forward. 10+ years later, what wonders have been wrought! Every staff home, office and dorm now has one or more phones, routed through a central switchboard – and, generally, they work. This year, a new VOIP systems makes international calls dirt cheap: Rs. 3 (7 US cents) per minute. The drawback is that the kids can call out from the dorm phones only during the limited hours when they are not in school, at activities, or studying, and usually have to wait their turn to do so. With families spread around the globe, this makes for a small window of time in which they can talk to their information-starved parents (who, in this day and age, expect to be able to stay in constant touch with their kids). Every staff home and residence has satellite television. Those who wish also have their own DVD players, stereos, iPod speakers, etc. Most staff homes are now on campus generators, so Mussoorie’s uneven power supply doesn’t fry out all that delicate electronic equipment. 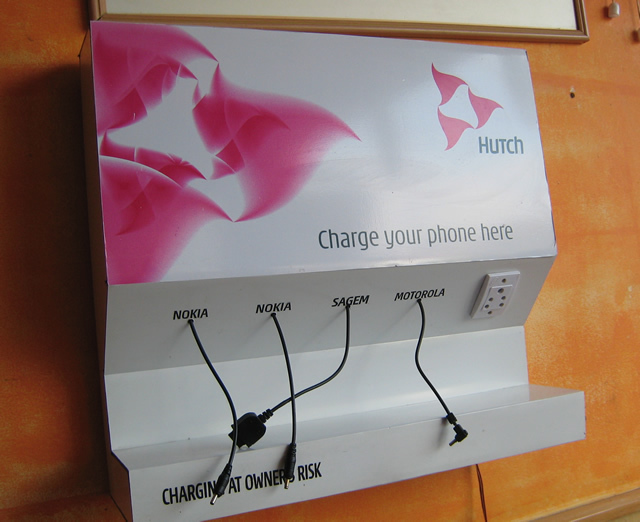 ^ mobile phone charging station at the Barista coffee shop in Kulri Bazaar, Mussoorie. And, of course, Woodstock is online. 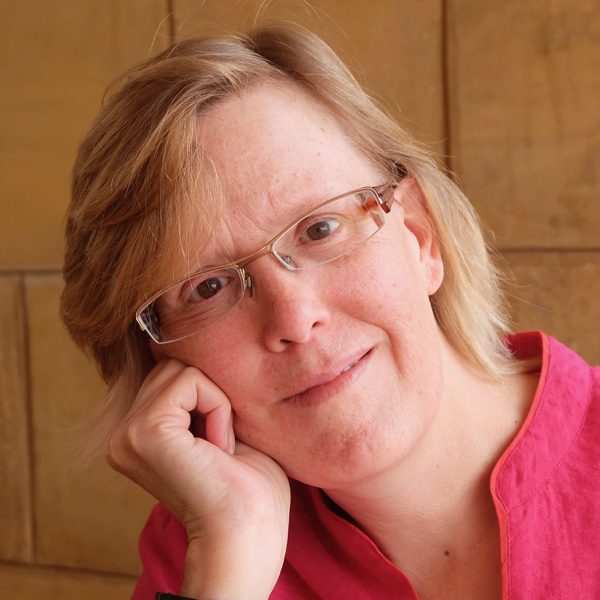 In 1998 I helped to create the school’s first website (the site has come a long way since then), and I trained staff members in web basics such as AltaVista search – on a connection that was so slow we had to turn off images in the browser in order to load a page at all. Today the school has about 300 computers connected to the Internet, sharing only 2 mbps of bandwidth among them. This is (barely) enough for general business and school use, but can’t stand up to today’s video-heavy websites, especially at those times of day when students are free to surf, email, etc. The problem is that bandwidth is still expensive in India (for lack of competition): it would cost at least $100,000 per year to get 8 mbps (ADSL) for the whole campus; by comparison, I can reliably get 7 mbps at my home in Italy for €39 per month. 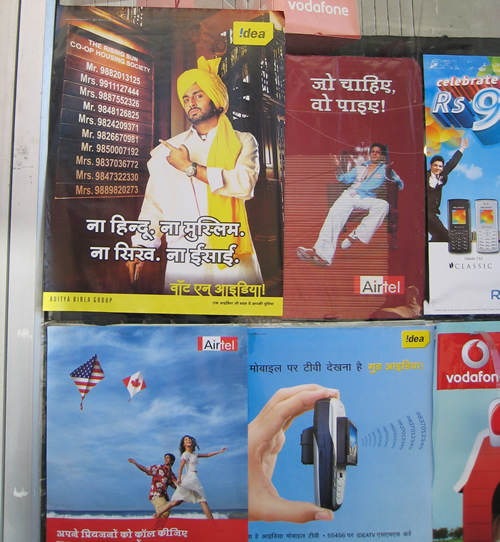 At these prices, no wonder India lags in Internet adoption. This situation is bound to improve: perhaps the long-promised fibre-optic cable to the school will finally be delivered, or maybe WiMax will come to India (this would be a better long-term solution than cables, which in rural India are frequently inadvertently dug up or cut). I look forward to the day when both the school and the country can enjoy the full benefits of this critical piece of modern infrastructure. This entry was posted in Woodstock School and tagged networked society, postal system, telecommunications, telephones, Woodstock School on November 25, 2007 by Deirdre Straughan. Fascinating to even think of Woodstock with all that technology and more to come! And I never thought I was really isolated back in the 50’s….. Indeed, it’s amazing to see the improvements India has made over the years. The country even succeeded in sending a spacecraft to Mars!